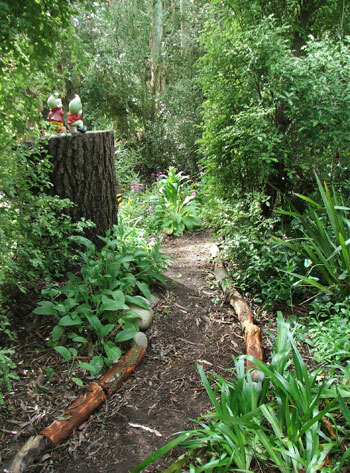 The Shrubbery area became 'gardenable' when a huge pine tree fell down in a storm in 2008. Naturally the stump was left behind, and I planted lots of tough foliage shrubs in the new spaces around it. 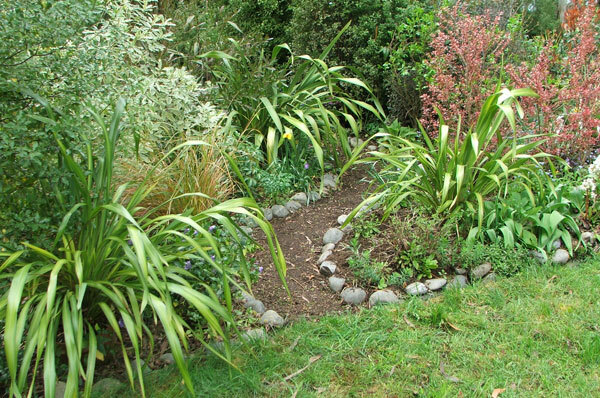 The paths came afterwards, initially to provide access to the garden for weeding. But of course my plantings grew, helped by many applications of mulch and compost. The first little path wiggled its way past Pittosporums and a group of pink Grootendoorst roses (one had to be shifted to make room). It's always been risky for wheelbarrow use, but provides lots of wobbly fun before it broadens and straightens out! William and Henry are still there, watching over the path. They've survived the earth shaking for 30 seconds (in our earthquake), two blustery snow storms, and the passionate attentions of big Fluff-Fluff the cat (who loves sitting on this tree stump). Vegetation on the sides of the Shrubbery paths is subtly different, though green foliage plants still do prevail. Periwinkle is encouraged to spread as a ground cover, and path-side shrubs include Genistas, Viburnums, red coloured Coprosmas, Olearias and several Australian Grevillias. I've planted Pittosporums underneath the row of huge (and difficult) Eucalyptus trees - these shrubs are brilliant fillers and will grow under anything. I rather over-reached myself in the year 2010, clearing yet more ground and pushing another path through the new area. It seemed a good idea at the time, but six months went by without me walking the path once. So I covered it up with mulch and planted Choisyas and Pseudopanax shrubs instead. Use it or lose it! Apart from trimming the self-sown Pittosporums so they don't tickle the face, weeding the mulched surface, and occasionally replacing an edging log that has gone rotten, I don't have to do much to the Shrubbery paths now. There's really no need to change anything. Mind you, I should be cleaning up the mess of gum bark and leaves... 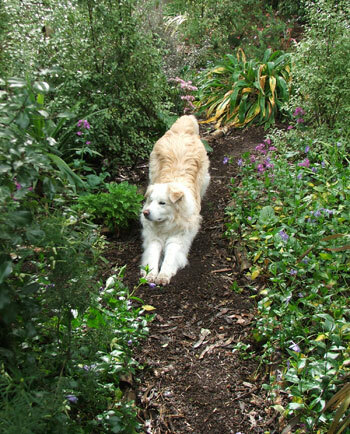 It's difficult to keep garden paths clean and tidy underneath gum trees, but it's fun trying!